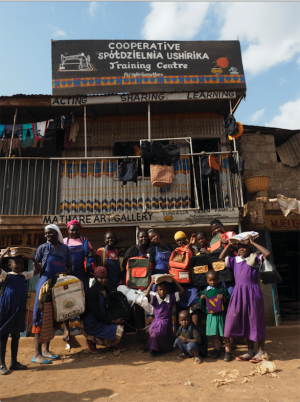 Cooperative Spółdzielnia Ushirika is a socio-artistic project, grounded in traditions of cooperative movements, run by the initiator and the community of Mathare Valley in Nairobi. Members of the cooperative produce mainly clothes and other accessories such as bags, school rucksacks, and travel bags, which are sold on and offline. Workers have an active role in the final form of the product they create, the work is not just limited to a passive re-making of a pre-established design. All cooperative members are provided with health insurance, a training, and workshops for learning how to use manual and electric sewing machines. According to the tribal tradition of the region, conversations and communal meals prepared by cooperative members are part of everyday work. Women are allowed to go to work with their children. Today, 10 women and a man are employed in the cooperative, the cooperative is equipped with 9 sewing machines (including 3 electric ones). The regular work shift is from Monday to Friday, 9:00 to 16:00 including a lunch break. To provide workplaces to people excluded by the economic system, contributing to a fair redistribution of goods. To ensure safe and healthy working condition. To provide training and skills improvement in sewing for its new members. The profit generated by the cooperative covers the salaries of the members and it sustains cooperative's costs such as rent, materials, equipment maintenance, purchase of food for communal meals and the remuneration for the teachers leading workshops. The cooperative fosters a change of economic and social situation of the cooperative's employees. It encourages well-being and comfort at work. Workers learn skills in preparation for labour market. The cooperative uses locally sourced materials, thereby supporting the local economy. Used tires and plastic bags are recycled. In the first 5 months of activity, workers have produced over 200 bags (the first 3 months consisted in the training period for the workers). Today workers produce around 200 bags and backpack per month. With the help of a local cobbler, workers produced a collection of sandals made from recycled plastic bags. The current team is: Elizabeth Akoth, Diana Adhiambo, Margert Adhiambo, Philgona Aluo, Brian Bera, Mary Mueni, Ann Mwikali, Millicent Ochieng, Susan Odhiambo, Maureen Otieno, Alicja Wysocka. The project was made possible thanks to the support and assistance of the Razem Pamoja Foundation.